A question and answer period will follow each webinar. Click here to register for the upcoming presentations. 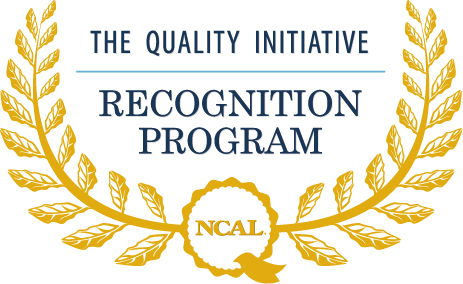 Similar to AHCA’s Quality Initiative Recognition Program, the NCAL program recognizes achievers in a tiered-approach, where member assisted living communities will increase their recognition as they accomplish multiple Quality Initiative goals. Visit the NCAL Quality Initiative Recognition Program webpage for all submission links and more information. All submissions must be received by NCAL by no later than 11:59pm EDT on Monday, September 30, 2013. Those receiving recognition will be notified in November. One glance at the work history of Vivian and Mary Tellis-Nayak says it all: These two individuals are a force in quality care. It came as no surprise to colleagues and friends that AHCA named Vivian and Mary the 2013 Mary K. Ousley Champions of Quality. Vivian, who commonly goes by his nickname of “V.”, and Mary have spent the greater portion of their lives advancing quality care in various ways, be it through research, clinical practice or advocacy for direct care workers. V., a renowned long term care researcher, quantitatively proved that Directors of Nursing (DoNs) and Nursing Home Administrators (NHAs) are directly related to skilled nursing care center quality performance. He also provided the first quantitative proof that quality in skilled nursing centers has a positive impact on financial revenue and that DoN and NHA turnover are the single best predictors of poor quality and revenues. Mary, a nurse by trade, has focused the majority of her professional career on promoting the importance, role, and function of certified nursing assistants (CNAs) and other direct caregivers. She authored several groundbreaking sets of standards for dementia care units, sub-acute care, and person-centered care. Mary continues to advocate nationally on the topics of quality, long term care leadership, and performance improvement. Throughout their careers, V. and Mary have blended their areas of expertise to provide a multitude of widely used and well-regarded surveys, leadership tools, and quality resources that focus on the importance of high-quality caregiving on overall performance. The couple has also been heavily involved with MyInnerView by National Research Corporation, for whom the couple continues to work. For their accomplishments in advancing excellence in quality care, V. and Mary will be honored at the 64th Annual AHCA/NCALConvention and Expo. For more information on the Tellis-Nayaks and the Mary K. Ousley Champion of Quality award, read the full press release. When it comes to politics, it’s often easy to forget the men and women who are impacted by decisions made in Washington. But at the heart of every issue there are people – lives that are affected by laws, rules, and regulations. So we’re putting faces, names, and stories to the topic at hand. Each of these stories comes from an individual who has voluntarily chosen to become an advocate for this issue by sharing his/her own personal experience. The Issue: Under the Medicare statute, patients must have an inpatient hospital stay of three or more consecutive days, not counting the day of discharge, in order to meet Medicare criteria for coverage of post-acute care in a SNF. As a result, although the care received by patients in observation status is indistinguishable from the care received by inpatients, outpatients in observation who need follow-up care in a SNF do not qualify for Medicare coverage. Hospital stays classified as observation, no matter how long and no matter the type or number of services provided, are considered outpatient. These hospital stays do not qualify patients for Medicare-covered care in a SNF. Read more about observation stays here and on the AHCA/NCAL website. This is the third post in the Facing the Issue: Observation Stays series. See previous posts here. Helen Sabin never thought she would be an advocate for access to quality care. However, after her husband became ill and had to go to the hospital, their situation catapulted Helen into a more active role. On April 14, 2013, Helen’s husband, Paul, became ill and was too weak to stand up. He had an infection, and the antibiotics he was on further complicated his medical issues. Helen called the paramedics, and after consulting with the paramedics, agreed to take check him into a hospital. Paul was checked into the hospital on Sunday and left on Wednesday afternoon, per a doctor’s request to have him stay an extra day for rehab. At this point, Helen had been planning to follow the doctor’s care plan to have him receive further rehabilitation at a nursing home to complete his recovery. On Tuesday, a hospital employee came to Helen and informed her that Paul had not been admitted to the hospital, but rather was categorized as under observation – a term that Helen was hearing for the first time. Because of his time spent in observation, Medicare would not pay for the much-needed skilled nursing care center stay. As many families learn the hard way, the conversation about long term care choices can be a very difficult one. There are many emotions at play - sadness at seeing a loved one in need of more care, guilt of an adult child for not being able to provide that care, and a burden on the side of a parent who is at the center of the conversation. However, having care conversations with family and friends can be a very rewarding experience for many families. Discussing a parent's desires for long term care, what to do in the event of a crisis, and planning out end of life care are all ways that families can grow together and make honest decisions that are for the best of all involved. Often many families wait to have these difficult conversations until there's an emergency on hand - a broken hip, a stroke, or a more complicated disease such as Alzheimer's. As this ABC Action News story explores, involving a parent in the conversation allows a parent to make decisions about his or her own care - eliminating some of the guilt and grief that adult children experience when making these decisions for a loved one. For many families, a natural care team develops, including the parent, adult children, medical doctor, and potential facilities. For more information on how to have these conversations with loved ones, visit www.CareConversations.org, where you can find checklists, medical care resources, blogs from experts on elderly care, and downloadable materials to assist in navigating this emotional conversation. Meeting the goals of the AHCA Quality Initiative? There’s ONE more week to let us know! In May, AHCA announced the Quality Initiative Recognition Program to honor those nursing centers which achieved one, two, three, or all four goals over the past year. AHCA members can still partake in this program and be recognized at AHCA/NCAL’s 2014 Quality Symposium. Just for the Recognition Program, AHCA has left the Association’s 2011 and 2012 national staffing survey open for centers that have yet to submit their turnover data. Individual centers can submit their customer satisfaction rates through a simple online survey (multis can use the excel sheet on the Recognition Program webpage). AHCA members can find all the necessary submission forms and directions on the Quality Initiative Recognition Program webpage. But don’t wait! The deadline for all submissions is THIS Monday, July 15, 2013 at midnight! AHCA/NCAL’s Twitter handle @ahcancal was featured as the tenth best Twitter account for #ElderCare according to Nursing Assistant Guides’ recently released list of the 101 Top Twitters for #ElderCare. Learning what skills and experience are in the highest demand at elder care facilities. Finding out about job openings and meeting people who could provide references. As baby boomers begin to reach retirement age, the population of American seniors will continue to expand at unprecedented rates. AHCA/NCAL hopes that @ahcancal will continue to serve as a popular resource to keep nurses and nurse’s assistants in senior care facilities well-informed. To see the full Nursing Assistant Guides’ list of the 101 Top Twitters for #ElderCare, click here. This is the second post in the Facing the Issue: Observation Stays series. See previous posts here. When White Oak Manor initially consulted with Mr. Robert King and his family regarding his stay at the skilled nursing facility, it was clear to everyone that Mr. King would be billed as a Medicare patient. He had just come off a four-day stay in the hospital, which had confirmed that Mr. King had indeed been admitted as an inpatient and met the requirements for Medicare Part A skilled nursing facility benefits. It was a surprise, then, not just to the facility, but to Mr. King and his family when that Medicare claim was denied. Upon further investigation with the hospital and its records, it was revealed that Mr. King’s first day in the hospital had been categorized as observation, while the remaining three days (but not three full days) were categorized as inpatient. White Oak Manor found that because Mr. King was a dual-eligible patient, or qualified for both Medicare and Medicaid coverage, his stay at the skilled nursing facility could be rebilled to Medicaid. However, under Medicaid, Mr. King is retroactively responsible for paying his monthly Medicaid liability while receiving his therapy and care. Had he qualified for the Medicare coverage, as both Mr. King and the facility thought, his first twenty days at the facility would have been completely covered by the Medicare program. "Most Americans aren't even thinking about it, but the numbers say we should be." The opening line to a Huffington Post article, "The Real Cost of Long Term Care," says what the long term care profession has been reiterating for years: long term care is, for many, an inevitable fact of life. Nearly 70% of all Americans will require long term care during their lives. The article and its accompanying infographic points out a few of the larger aspects of preparing for long term care, such as costs, family caregiving, types of care, and long term care insurance. For more information on planning for long term care in your family, visit www.CareConversations.org for resources and guides that can help you and your loved ones make the best decisions about care.